Autumn should be around the corner and summer a long way away. A lot of brown and dry is still to be seen in nature, though some crocus and other battle the cold. 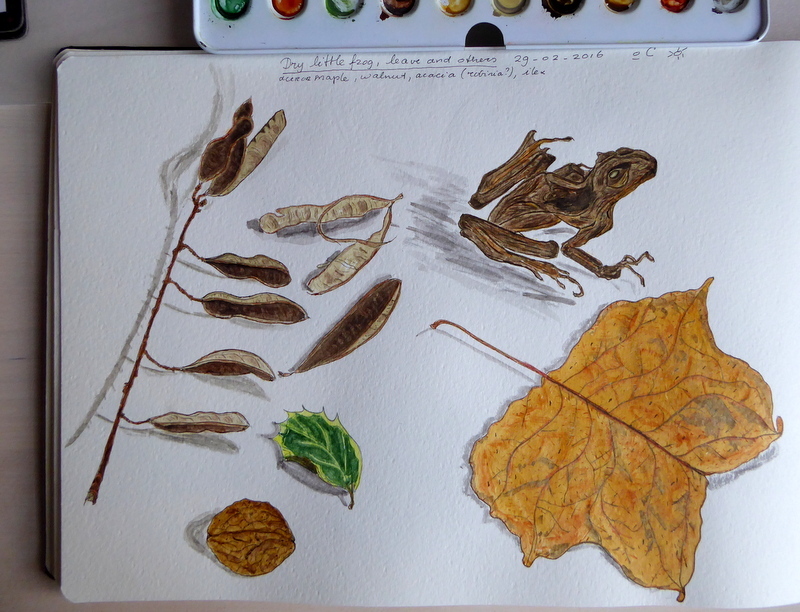 I painted some dry things; I found a dry pathetic looking little frog in my cellar and some leaves and things while walking. Acacia(robinea? )pods, half a walnut, leaf of an ilex and sycamore. I explored a whole range of brown: sepia, Vandijck’s earth, terra Pozzuoli, gold brown, translucent brown, burned umber, burned sienna, umber natur, sienna natur and some madder brown.